Protesters at the "Transit Not Traffic" rally try to catch the attention of commuters in Allston. The tuba player is the first to arrive at the intersection of Cambridge Street and the River Street Bridge. He is here to boost morale for the rally-goers, a welcome contribution on this 22-degree morning, colder with windchill, colder still in the shadow of the Allston DoubleTree Suites hotel. At 8:02 a.m. the crowd is two dozen strong, and traffic is slow on the Massachusetts Turnpike. Traffic is always slow on the Massachusetts Turnpike. More rally-goers in brightly colored parkas are waving hand-painted signs toward the gridlock. “And all the transit advocates on the median!” A small cohort of shivering, sign-wielding locals cheer from across several lanes of traffic. Despite the bitter cold, the “Transit Not Traffic” Rally on Jan. 25 is in full swing. This rally was organized by People’s Pike, a coalition of Allston residents and other locals advocating for functional transit. The group plans to march to Governor Charlie Baker’s reelection headquarters on Lincoln Street in Allston to voice the coalition’s frustrations directly. Protesters at the 'Transit Not Traffic' rally try to catch the attention of commuters in Allston. The mood is vaguely celebratory after an exciting announcement from Harvard the day prior: the University pledged $50 million toward the construction of West Station—a long-awaited transit stop—and an additional $8 million toward an interim station meant to satisfy transit needs in the meantime. Harvard owns more land in Boston than in Cambridge, and has huge power to set the course of the neighborhood over the next several decades. Allstonians have been asking Harvard to front the total cost of the station—around $90 million—but for now, the commitment is appreciated. No one knows how long “the meantime” is, but based on this morning’s traffic, protesters say a solution is sorely needed. 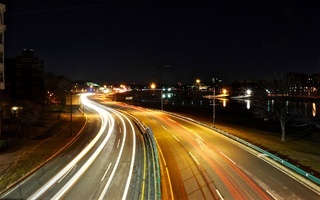 Weeks prior, the Massachusetts Department of Transportation released a report outlining potential impacts of the upcoming I-90 Interchange Improvement Project. The project plans to realign the “structurally deficient, functionally obsolete” stretch of the Mass Pike to make it safer and more efficient. This will effectively reconfigure the neighborhood. The project has been described as “multi-modal,” meaning it will plan for pedestrians, bikers, and transit riders, as well as drivers. He is one of several children holding signs before heading off to school. This neighborhood is home to college students and elementary school students alike, recent Boston University graduates and locals who’ve lived in the area for sixty-plus years. All kinds of Allstonians are affected by the congestion—and proposed development—around I-90, and a multi-generational group of neighbors has stepped up. This is not a new scene—Allstonians have grown accustomed to pushing back. Residents often advocate for their neighborhood amidst the various agendas and development projects of Harvard, the city, and the state. But in 2018, everything seems to be coming to a head. Mook stands at the corner of Windom and Hopedale, bike characteristically in tow. 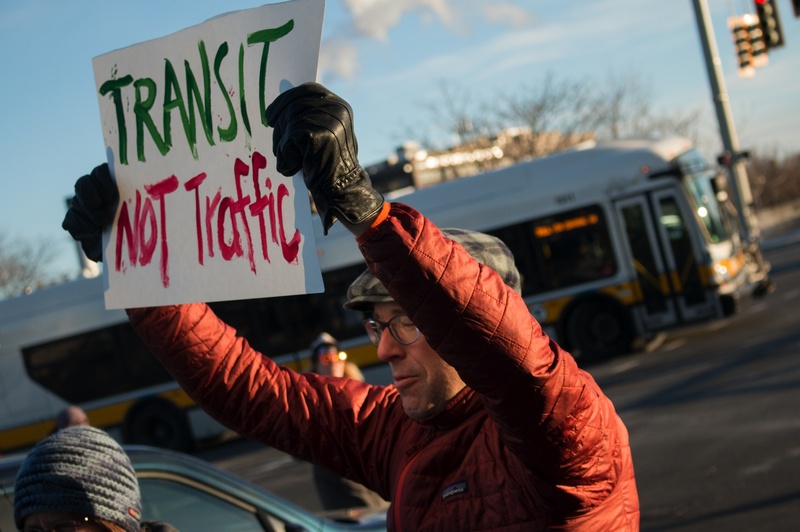 It’s early evening on Jan. 25—the “Transit Not Traffic” rally was this morning, which Mook deemed a success, even though the cold prevented the group from marching all the way to Governor Baker’s office. Galen M. Mook is an Allston transit advocate and bike store proprietor. Mook says he is well-acquainted with this neighborhood. He’s lived in the Allston-Brighton area for 14 years—which he’s quick to point out is not a long time, compared to others. Mook is the marketing and advocacy associate for Landry’s Bicycles, a member of the Allston I-90 Interchange Task Force, and a central figure among People’s Pike transit advocates. Mook refers to the Harvard development project currently on the horizon. The enterprise research campus is billed as a “regional innovation hub” and will be home to both residential and commercial buildings. “You wanna play street hockey on this street, right?” says Mook, pointing to the now-deserted road. Windom Street is flanked with street-parked cars, but otherwise offers a perfect street-hockey location. This makes the thought of hundreds of cars cutting through this street every morning more jarring—and it’s perhaps only a fraction of what’s to come. 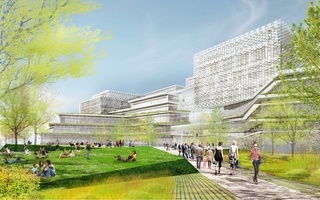 The development of the enterprise research campus would usher 1,700 new people into Allston every morning. “Windom Street is actually very worried right now,” Mook says. The landscape, he points out, demonstrates Allston’s position at the intersection of powerful institutions, and the problems that arise at that intersection. The street suffers from highway congestion caused by the Massachusetts interstate system and exacerbated by Harvard’s development. It lies adjacent to Harvard’s Enterprise Research Campus, and sits in the looming shadow of a monolithic Boston University building. A flashing light interrupts Mook’s description of the neighborhood: Priscilla R. Anderson turns the street corner, her bike helmet’s safety light piercing the almost-dark. She immediately asks Mook how the rally was (“so cold”) and introduces herself as a neighbor, apologizing both for interrupting and for being unable to attend the morning’s rally. The two have a brief aside, both holding bikes, to exchange information on enterprise research campus meetings and comment periods. Anderson is an Allstonian, and moved to the region in 2001 to work as a preservation librarian for Harvard University Library. Because of this connection, she trusts Harvard more than many of her neighbors do and considers herself a moderate voice in the conversation. As Olsen explains, “To be a transit advocate in Allston is to constantly be talking to at least three major audiences.” In addition to working with People’s Pike, Olsen is the former executive director of Allston Village Main Streets, a neighborhood community development organization. At neighborhood meetings, she is often one of the youngest and most vocal people in the room. The first audience she’s referring to is the City of Boston, which manages the development process in all of the city’s infrastructure. The second is the state and Commonwealth, which oversees Mass Pike, as well as stretches of various major roads in Allston. The third, she says, is “always Harvard and sometimes B.U.” She calls them the “giants at the table” due to their considerable property and influence with the city. This is part of the reason why Harvard has pledged the money for West Station—the neighborhood expects community benefits as Harvard breaks more ground in Allston. 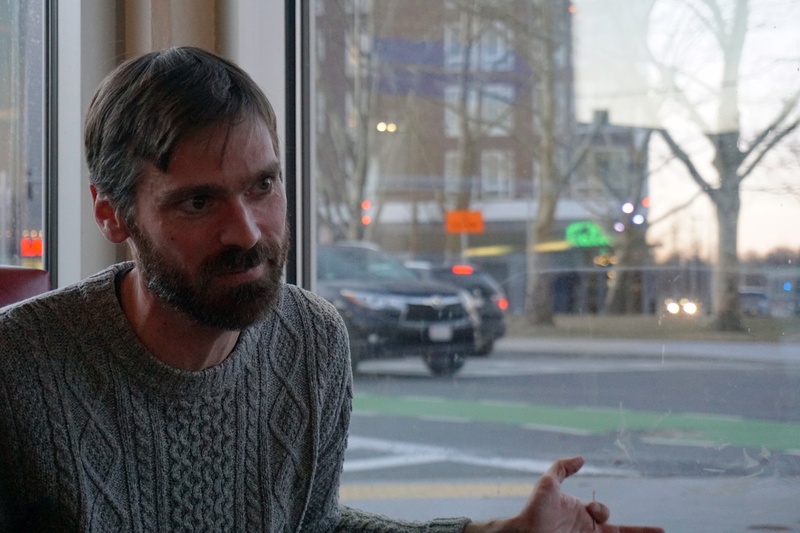 Ari Ofsevit is a Cambridgeport-based transit activist who has run a transit blog for the past ten years: “Something that a surprisingly non-zero number of people read,” he says. In addition to dealing with several institutional entities, he cites geographic location as a source of the neighborhood’s grievances. Allstonians make up only a fraction of the daily congestion on the Pike. Commuters from all around the Boston area pass through Allston, and residents are quick to emphasize that West Station is not just a gift to Allston, but a matter of regional significance. The area’s lack of public transportation makes commuting by train slow and tedious, so people drive. West Station would give Allstonians transit access—and get drivers off the roads. The impassioned locals are not alone in their fight for functional transit. Major transit and infrastructure-related advocacy organizations in the Boston area have thrown support behind Allstonians. On Jan. 17, five Massachusetts politicians, including Representative Michael Moran, released a comment letter urging Harvard to pay the full cost of West Station—a gesture transit advocates welcomed after MassDOT’s 2040 projection for the station’s completion. 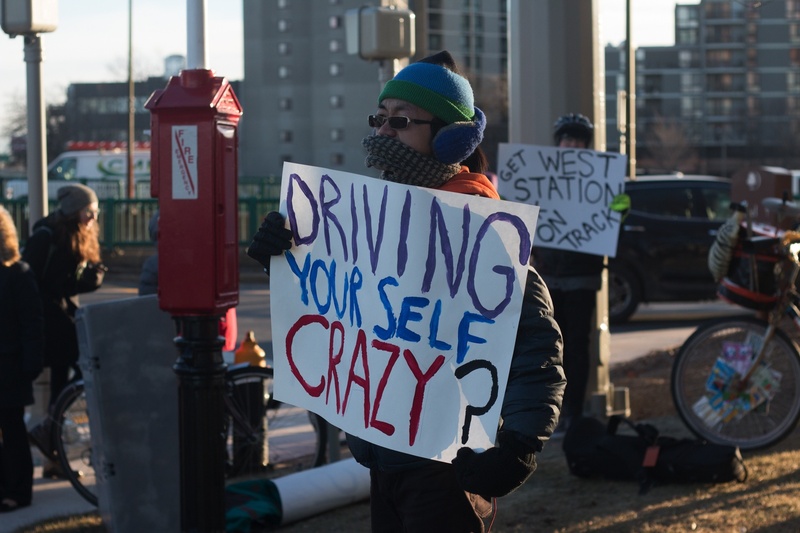 City Councillor At-Large Michelle Wu ’07 released a comment letter on Feb. 5, after Harvard’s pledge of $58 million, that asked for West Station to be built in the first stage of the I-90 project instead of the second. On Jan. 22—days before Harvard’s $58 million pledge—the Impact Advisory Group, composed of Allston residents and Harvard officials, convenes at Harvard’s i-Lab to discuss plans for the Enterprise Research Campus. Allstonian Joyce Radnor is in attendance, and she’s annoyed. The residents have been skeptical of Harvard’s proposals: too many parking lots and not enough transit options. To some residents, Allston’s long-standing, fraught relationship with Harvard presents an opportunity for neighborhood improvement. For others, the encroachment is inevitable and West Station is the consolation prize. Despite Harvard’s power on paper, university representatives and Allstonians squabble and negotiate in meetings like an old married couple. An IAG member has been diligently writing down attendees’ questions on a whiteboard. “I was wondering about directing questions to the audience instead of to the IAG,” she says. Her use of the word neighbor is, of course, literally true. (“We are neighbors. You know, we see each other on Halloween,” Olsen says.) But the ubiquity of this word in conversations around advocacy in Allston hints at its rhetorical significance. Radnor bought her Windom Street home in Allston in 1995, but traces her neighborhood advocacy involvement to the events of June 1997. That’s when Harvard announced that between 1988 and 1994, they had spent $88 million and acquired 52.6 acres of land in Allston, unbeknownst to Allstonians, the previous landowners, or even the Mayor of the City of Boston. Loud clanging from construction on SEAS's new Enterprise Research Campus disrupts the quiet of residential Windom Street. “We had a new neighbor, and it was a big neighbor,” Radnor says. She began going to local meetings. Radnor says she tolerates the SEAS complex. “Those are institutional uses that in the long run are nice additions to the neighborhood,” she says. But the enterprise research campus, which will bring “a bunch of commercial buildings” near Radnor’s home, is “beyond comprehension” to her. After two decades of years of experience dealing with the University, she says she’s resigned. “The minute they start, you can’t stop ‘em,” she says. The University acknowledges its position as a neighbor, and maintains a sense of accountability for the area. 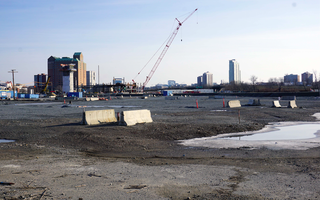 When Harvard made its financial pledge, Executive Vice President Katie N. Lapp released a comment letter to MassDOT encouraging the early construction of West Station. Following that announcement, Lapp submitted a comment letter on behalf of the University, directed at Secretary Matthew A. Beaton of the Executive Office of Energy and Environmental Affairs, outlining their intentions for involvement with the project. The concurrence of the Enterprise Research Campus and the I-90 Interchange Project means it’s a pivotal moment for the neighborhood. The sheer scale and long-term planning of the I-90 Project will lead to a substantial reconfiguration of the Allston landscape. It’s a matter of shaping a new neighborhood altogether. Allstonians say the new population density brought by the enterprise research campus only makes the need for transit more critical. Harvard’s presence complicates matters, but no one denies that it signifies opportunity. If neighbors put in the hours now, then—for the first time in a half-century—there is the possibility of transit in Allston. Alana Olsen cannot sit still. Dozens of neighbors sit in the community meeting room at the Honan-Allston Library. It’s a few days after the “Transit Not Traffic” rally, but this scene better represents what it means to be a “neighbor” in practice. Allstonians often describe a sense of exhaustion associated with the perpetual cycle of community meetings. A protester holds up a sign at the 'Transit Not Traffic' rally. James E. Gillooly, the deputy commissioner at the the Boston Transportation Department, and Warren O’Reilly, the Allston-Brighton Neighborhood Liaison from the Mayor’s Office, stand at the front. They’re here to discuss the traffic on Windom Street. Olsen is darting around the room. She clarifies, interprets, probes, and plants herself next to different residents in the crowd to confer. Sometimes she paces in the back. Commuters on I-90 have been cutting through neighborhood streets. Neighbors can’t pull out of their driveways in the morning on Windom Street, and the impending construction on I-90 will only worsen the congestion. “We’ve had three meetings for your neighborhood,” O’Reilly tells the Allstonian. Up front sits Tony P. D’Isidoro, a lifelong Allston resident who still lives in the Raymond Street home his parents bought after his father’s return from World War II. He collects community titles like stamps: President of the Allston Civic Association. Member of the IAG. Member of the I-90 Task Force. Former captain of the Brighton High School baseball team. His biggest claim to fame is his “Community Notes,” he says, referring to his twice-weekly newsletter. “The other traumatic experience that really raised activism was Barry’s Corner,” he adds. 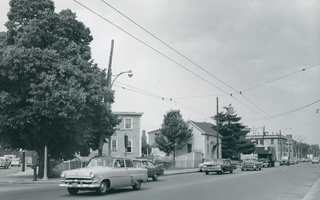 In 1961, the then-Boston Redevelopment Authority, the city’s urban planning body, announced plans to demolish a small subset of the neighborhood. Letters went out to residents that their houses were to be taken by eminent domain. Many resisted. “There were protests every night,” D’Isidoro says. “We heard stories at the end—it got so bad at the end that a few of the people that were holding out went out to go shopping. When they went out, [the BRA] went in and changed the locks so they could knock the houses down. They got pennies on the dollar,” he says. There is a sense of intergenerational solidarity in the work of Allston’s neighbors. D’Isidoro warmly commends the contingent of young people focused on transportation advocacy. “When Galen or [other young people] speak at the I-90 Task Force, they’re taken very seriously because you can tell that they’ve done their homework,” he says. Harry E. Mattison meanders in front of the DoubleTree Suites hotel, pushing his bike along. He is the newspapers’ favorite neighbor, a member of several task forces and a vocal critic of Harvard, the city, and the state. Mattison recently made television and radio appearances on WGBH and WBUR discussing the I-90 Interchange Project. He is also, perhaps, Allston’s resident cynic. Mattison moved to Allston after college in 1994 and became involved in transit advocacy after observing the neighborhood’s unsafe streets. “When people get killed in your neighborhood walking and riding a bike, you know, you think maybe we should do something.” He rattles off three deaths in recent memory. Walking his bike down Cambridge Street, Mattison gestures toward the site of the future enterprise research campus. “It would be great for all this land to be developed, for there to be more housing and jobs,” he says—with the caveat that he first wants to see transit plans firmly in place. He points out the trash that litters the side of the Turnpike, and mentions filling three bags of trash on the street over the weekend. He points to the bike lanes that are now habitually used for ad-hoc vehicle parking, and recalls attending the months of meetings they required. The more commonplace word is “advocate.” Allstonians are advocates and neighbors. They want to better the neighborhood. John A. Bruno is a lifelong Allston resident (“I was born on Western Avenue,” he quips.) He has sat on a number of selection committees, co-authored Article 51 (the zoning document for Allston and Brighton) and is a man of many task forces. Most notably, he chairs the Harvard-Allston Task Force. “I have a pretty good stake in the community,” says Bruno. This seems like an understatement. And yet, they go to the meetings. They spend the unpaid hours reading the technical transit briefings. There is a sense, in talking to the neighbors, that the word “activist” is absent because it is implicit. Long-term life in Allston yields a particular breed of citizenship. The neighborhood sits at the junction of Harvard, the city, and the state; nestled between Cambridge and Boston and between Boston and its Western suburbs. 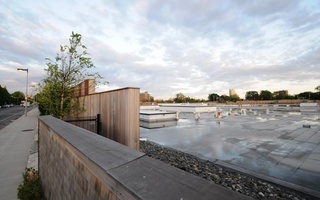 Residents who are invested in the character of the neighborhood must be constantly advocating for the endurance of this character—a perennial advocacy. After a several-minute-long digression on Allston’s inefficient bus routes, Bruno momentarily switches gears. A month later, he recalls, during the first snow of the winter, snow flew off of a plow and knocked down part of the fence. Residents called state authorities, who came and repaired it. “It’s sort of like Charlie Brown and Lucy, and she pulls the football away,” he says. Before mounting his bike in front of the Honan-Allston Library, Mattison pauses. “Am I too jaded?” he asks. —Magazine writer Norah M. Murphy can be reached at norah.murphy@thecrimson.com. Follow her on Twitter @norah_murph. —Magazine writer Eva K. Rosenfeld can be reached at eva.rosenfeld@thecrimson.com. Follow her on Twitter @evakrosenfeld.